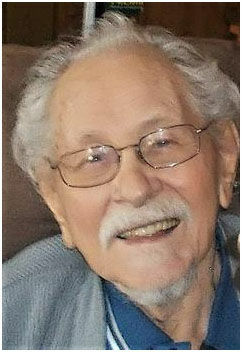 EVANSDALE — Eugene Liebert, 93, of Evansdale, died Monday, March 11, at Cedar Valley Hospice Home. He was born Feb. 20, 1926, in Charles City, son of Walter and Lillian Hartong Liebert. He married Nadine DeWater Stephens in 1972; she died in 1996. He married Jean Hardee Richmond on Nov. 19, 1999. Eugene served in the U.S. Army Air Force during the Korean War. He worked for John Deere as a scheduler retiring in 1981 and was a member of Evansdale AMVETS Post 31. Survived by: his wife; six stepsons, Jarrell (Martha) Stephens of Waterloo, Steven (Diane) Stephens of Normal‚ Ill., John (Beth) Stephens of Sioux City‚ Randy Richmond of Waterloo, Craig (Fran) Richmond of Evansdale, and Rick (Julie) Richmond of Billings‚ Mont. ; two stepdaughters, Sherryl Jacobsen of Evansdale and Kimberly (Jeff) Hilbert of Waterloo; and several grandchildren, great-grandchildren and great-great-grandchildren. Preceded in death by: a daughter, Susan Kay Liebert; two brothers, Floyd and Orville Liebert; a sister, Grace Trumbauer; a stepson-in-law, Jerry Jacobsen; and a stepdaughter-in-law, Jan Richmond. Services: will be at a later date. He enjoyed puzzles, fishing, hunting, tinkering, carpentry and anything mechanical. Obituaries and service notice in today's Courier.